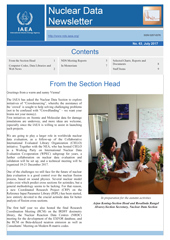 INTERNATIONAL ATOMIC ENERGY AGENCY, Nuclear Data Newsletter No. 63 Issue No. 63, July 2017, Nuclear Data Newsletter No. 63, IAEA, Vienna (2017).